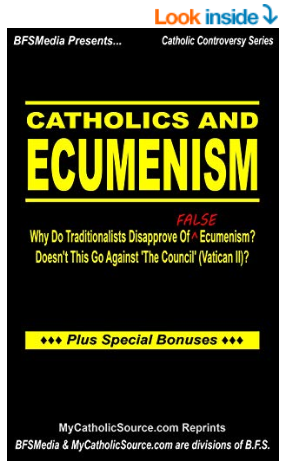 Hate (false) ecumenism? Let Scripture, Popes, Saints, Councils, Doctors of the Church, Catechisms, etc. provide some greatly needed clarity on ecumenism. Note: An enhanced version of this article is now available in Kindle & paperback versions! Click here for more information and to purchase. [Jesus commissioned the apostles:] "He said to them, 'Wherever you enter a house, stay there until you leave from there. Whatever place does not welcome you or listen to you, leave there and shake the dust off your feet in testimony against them.'" (Mk. 6:10-11) Note: Jesus did not instruct them to stay and dialog with those who would not accept His message or to "package" the message in terms they might find more preferable or to simply ignore their differences and work together in the name of "peace", understanding, or "tolerance". Rather, he tells them to shake the dust off their feet in testimony against them. [Jesus instructed the apostles,] "And as for those who do not welcome you, when you leave that town, shake the dust from your feet in testimony against them." (Lk. 9:5) Note: Jesus has made it clear that those who fail to receive the persons He has sent will incur reproach or condemnation. In contrast to the ecumenical movement, Jesus does not discuss "dialoging", "coming to the truth together" (as if it was not already possessed), or "seeking to find the good" in the belief systems of those who reject the truth. [Jesus told those whom he sent ahead,] "Whoever listens to you listens to me. Whoever rejects you rejects me. And whoever rejects me rejects the one who sent me." (Lk. 10:16) Note: Once again, Jesus did not instruct his disciples to stay and dialog with those who would not accept His message or to "package" the message in terms they might find more preferable or to simply ignore their differences and work together in the name of "peace", understanding, or "tolerance". He clearly shows that those who fail to receive the persons He has sent will incur condemnation. "I urge you, brothers, to watch out for those who create dissensions and obstacles, in opposition to the teaching that you learned; avoid them. For such people do not serve our Lord Christ but their own appetites, and by fair and flattering speech they deceive the hearts of the innocent." (St. Paul, Rom. 16:17-18) (emphasis added) Note: In contrast to the "spirit of ecumenism" which attempts to mingle all faiths under one umbrella, Scripture tells us plainly that we should avoid those who create dissentions in opposition to the true teachings of the Catholic Church. "But even if we or an angel from heaven should preach (to you) a gospel other than the one that we preached to you, let that one be accursed! As we have said before, and now I say again, if anyone preaches to you a gospel other than the one that you received, let that one be accursed! Am I now currying favor with human beings or God? Or am I seeking to please people? If I were still trying to please people, I would not be a slave of Christ." (Gal. 1:8-10) Note: While the Bible teaches us that those who pervert the gospel of Christ are accursed - even if the one doing so was an angel from heaven - the ecumenical movement wants us to gather together with them as if nothing was wrong with their accursed doctrines in the name of "peace", "tolerance" and understanding. But, as Scripture says, "Am I now currying favor with human beings or God? Or am I seeking to please people? If I were still trying to please people, I would not be a slave of Christ." We must please God, not human beings and reject perverted gospels. The modern ecumenical movement, however, generally spurns accusatory statements such as those contained in Scripture and seeks to allow others to preach their different gospels to us in the name of "dialoging". "After a first and second warning, break off contact with a heretic, realizing that such a person is perverted and sinful and stands self-condemned." (Ti. 3:10-11) Note: In this rather "unecumenical" statement, we are told to "break off contact with a heretic, realizing that such a person is perverted and sinful and stands self-condemned" after a first and second warning. The modern ecumenical movement prefers rather to "dialog" with heretics rather than admonish them as we are instructed to do in Scripture. "Anyone who is so 'progressive' as not to remain in the teaching of the Christ does not have God; whoever remains in the teaching has the Father and the Son. If anyone comes to you and does not bring this doctrine, do not receive him in your house or even greet him; for whoever greets him shares in his evil works." (2 Jn. 1:9-11) (emphasis added) Note: In this highly "unecumenical" Scripture passage, we are warned about those who are "progressive" and do not remain in the teaching of Christ and instructed that "If anyone comes to you and does not bring this doctrine, do not receive him in your house or even greet him; for whoever greets him shares in his evil works". Scripture does not tell us to "dialog" or to "seek out the good" or to gather for religious activities with anyone who brings another doctrine, despite the encouragement by the ecumenical movement to do just these things. In fact, to do so is contrary to this passage of Scripture. NOTICE: THE REMAINDER OF THIS ARTICLE IS NOT PRESENTLY AVAILABLE. Please try back later or click here to purchase a Kindle or paperback version of this article.